Even if George Bluth, Sr. never makes it back to television and/or onto the big screen, Jeffrey Tambor can sleep soundly knowing that his contributions to the world of comedy are already more than sufficient, thanks to six seasons of Hank Kingsley on The Larry Sanders Show and the existing 53 episodes of Arrested Development. 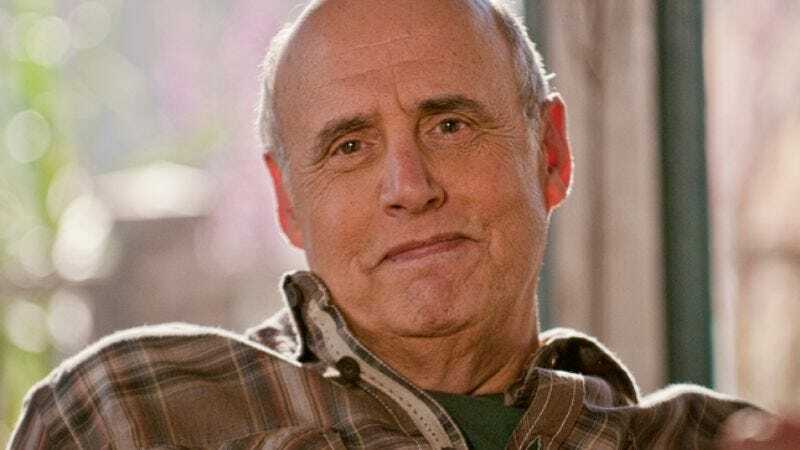 Never one to rest on his laurels, however, Tambor has picked up another full-time gig to keep him occupied until Mitchell Hurwitz calls again: Tambor is serving as the elder comedic statesman on the new NBC sitcom Bent. The A.V. Club met up with Tambor during January’s Television Critics Association press tour to talk about his new series, his feelings on single-camera vs. multi-camera, and his excitement about recently re-teaming with Al Pacino, 30-plus years after their first collaboration. The A.V. Club: Can you offer a nutshell description of your character on Bent? AVC: You seem to do your best work, or certainly your most memorable work, in ensemble comedies. JT: I like ensemble comedies. You know, people think we sit by the poolside picking and choosing scripts, but this one came in at a very nice time. I really like [executive producer] Tad Quill a lot. I trust him with my life, which is comedy. Amanda Peet and David Walton are terrific. And, as you say, it’s an ensemble cast. I love that. It makes good comedy. I think it’s funny, relatable, edgy, kind of cable-y television, which I like. The degree of difficulty is hard. And it doesn’t pander, which is always good. What’s interesting about that cast is that it’s been painstakingly selected, so everywhere the eye goes, I think the audience will be very confident and pleased. I’m really happy about that. I’ve really fallen in love with this cast and this work experience. It really was great, so I hope the audience agrees with my perception. The byplay between Amanda and David and I is so much fun. I have scenes with all of them, and they’re just delightful. These two are real comedy long-ball hitters, and I think the audience will be really taken with them. I know I am. JT: Yeah, the rule has actually now been amended to specify Joey King, because she’ll steal a scene right out from under you. [Laughs.] No, I love Joey. She’s terrific. Joey is a home-run hitter who hits the ball hard when she works. She’s 12 going on 174. I love her. She’s so quick. AVC: Joey’s already a star among the pre-teen set for playing Ramona Quimby in 2010’s Ramona And Beezus, but you’ve done your fair share of kid-friendly material as well. JT: Yes, I’m currently very chic in my house. [Laughs.] I’ve done Yo Gabba Gabba! I’ve done… oh, it’s not called Rapunzel anymore. Tangled, that’s it. Those are both huge. I’ve done a Muppet movie [Muppets From Space], I did How The Grinch Stole Christmas, and I’m a knockout with the young ladies in my daughter’s class and my son’s class, because I play Mister Salomone in the Eloise films. I’ve also done three or four seasons of WordGirl, and what a pleasure that is. It started out as a one-er, and it just kept going. I’ve been doing a lot of that lately, and I’m very proud of WordGirl. I’ve had a great, great time. I always look forward to doing that. AVC: And on the opposite end of the animated spectrum, you’ve also done several episodes of Archer. JT: Those were great. A lot of people watch that show, too. It was wonderful. AVC: It’s also a perfectly organic tie-in to Arrested Development, since you work with Jessica Walter on Archer as well. JT: [Laughs.] Exactly. This show-business thing, huh? We got a chance to say “hello” to each other, at least. Oh, I love Jessica. AVC: So let’s get it out of the way: Has Mitchell Hurwitz at least called you up to tell you, “I really am working on the Arrested Development scripts, swear to God”? JT: He really is working on it. We’ve had lunch. But, honestly, I know you hear this all the time, but you know as much as I do. I think it’s a “yes” to all the categories, but the “when” is the big question. We’re all very excited, though. It’s great. AVC: Has he teased you with any of the stuff he’s considering for George Bluth, Sr.? JT: No. Nor would I ask. But nothing would surprise me. That was the great, great thing about that show. You’d get that script the night before, even at 6 a.m. the morning of, and it would be a total surprise. It’d say, “This morning, you’re going to be painted blue.” [Laughs.] “And the Blue Men will be doing your makeup.” It’s hysterical. I love it. That’s the kind of stuff I went into the business for. The greatest surprise I ever had in my career, though, was when I was on Hill Street Blues. Do you recall that? AVC: Yes, you made some decidedly unique fashion statements. JT: [Laughs.] That’s right. I was a cross-dressing judge. I went to my fitting, I went to the suit rack, and they said, “Uh-uh, over here.” And there were just a bunch of dresses. That was before I saw the script, by the way. But I like those kinds of surprises. It’s fun. And it’s all I’ve ever wanted to be able to do with my life. To be able to go between doing a Phil Spector movie with Al Pacino, Helen Mirren, and David Mamet, which I just finished a little bit ago, and then to be able to go over to Yo Gabba Gabba! almost the same week, and then going off to do this wonderful series, Bent… I mean, give me a break. That’s what a character actor is supposed to be. I’m very lucky. AVC: There’s something a bit different in your career than most character actors have, though. You’ve certainly been in a lot of things, but you actually have full-time gigs on a regular basis, as opposed to constantly jumping from project to project to project. JT: Well, I’ve certainly been very lucky. I’ve been in three sort of… I mean, I’d say they’re groundbreaking series, if only because of the creators. One was Max Headroom, another was The Larry Sanders Show, and the third was Arrested Development. And, y’know, that’s given me a little bit of… credence? I don’t know. It’s helped me quite a bit, anyway. So I’m very fortunate, and I’m very beholden to those guys. AVC: What’s the line fans most often repeat when they come up to you? AVC: You’ve done single-camera and multi-camera sitcoms. Do you prefer one over the other? JT: [Instantly and loudly.] Single-camera! [Laughs.] If you look back, I’m not great on multi-camera. I don’t think I’m great, anyway. Of course, my agent will kill herself on this one, but… I do okay. I just don’t like the nerves of it. In Yiddish, we say, “Nisht ahin un nisht aher.” It’s neither here, it’s neither there. I get more nerves than on anything I do when I’m doing multi-camera. But single-camera, I love very much. It’s fun to play, and… I just like that work a little better. The chess game is a little more fun for me. I like them both, though. I just like comedy, you know? [Laughs.] It doesn’t really matter which venue it is. If the writing isn’t there, it doesn’t matter what vehicle you have. But on Bent, the writing is there. It’s so brilliantly crafted. It’s subtle and edgy at the same time. I love it. AVC: When it comes to doing sitcoms, you’ve been around the block a few times. In fact, you’ve been doing them since your very first full-time TV gig, when you played Jeffrey P. Brookes III on The Ropers. JT: That’s true. It was my first time as a part of a series, and I didn’t know what being part of a series was all about. That was the same year I did … And Justice For All, so… It was just an odd, odd thing, really. I made $6,000 per week, which I thought was a million dollars. I learned a lot. I loved Norman [Fell] and Audra [Lindley], and Patty [McCormack], and I had a great time. It was wonderful. It’s interesting, but… the great thing about acting is that you kind of do what’s there and do it the best you can. But I loved it. It was a great experience. AVC: Presumably there was a bit of a learning curve for you, given that you were just getting your feet wet on television. JT: A huge learning curve. Huge. AVC: Were Norman Fell and Audra Lindley helpful in steering you in the right direction? JT: Oh, well, I loved Norman. Norman was an intellectual, and he had this sad-sack dog face—and I mean that in a totally honorific way—and yet when he would come to my house, I would always find him in my library, reading a book. Audra was great. Patty and I clicked. And I loved [executive producers Don] Nicholl, [Michael] Ross, and [Bernard] West. They were so kind to me. They were paternal, in a way. I felt sorry for them, because here was this actor who’d come from Broadway, and I just… I didn’t know how you made a show. When they gave you a note, you had to stand up and do it, and I thought that was just ridiculous. [Laughs.] But I remember the first time I had to do that. Audra just kind of looked at me, winked, and was, like, “Come on, let’s go.” It was good for me. Taught me a lot. AVC: That seemed to be the start of an era when the majority of your roles were that of the stuffy grouch, the resident bad guy, or somewhere between the two. AVC: How did you enter into acting in the first place? JT: I was very lucky. I grew up in San Francisco, and during my youth, I lived right across the street from San Francisco State College. They had a theater program, so I used to go over there at a very young age and watch the actors—who were 18 years old, but might as well as been 70, given how young I was—do scene work, and I used to sit in the dark and watch them rehearse and separate it and put it back together. I thought I was in heaven. I’d just never seen anything like it. It was so exciting. And I sort of befriended them. I would sit and watch the rehearsals, help strike the sets, and sometimes even give suggestions. I think they were just being kind to me. [Laughs.] Basically, they just used me to strike their sets. But it was wonderful. It was a wonderful education. AVC: At what point did you decide you wanted to make a career out of it? JT: Oh, right then. I fell in love. I remember thinking that whatever this was, it was terribly exciting and terribly inviting. And it seemed sort of like a family. I enjoyed that so much. And the fact that you could alter what you were performing and change it? I still like that. I think you ask any actor, and they’ll say rehearsal is the most fun, because you take it, put it back together, take it and put it back together again. It’s a wonderful form of playing, actually. So, anyway, I guess I would’ve been somewhere around 9 or 10 years old. Maybe 11. Something like that. JT: Hmmm. That’s an interesting question. You know, I’ve always been sort of naïve when it comes to this, because I always kind of consider it to be playing, but… I would imagine that might’ve happened when I first hit the business aspects of it as a career. Or maybe… [Long pause.] This is a really good question, so I want to make sure I answer it right. I’ll say that it’s never gotten physically hard, even when it was eight shows a week on Broadway. Sometimes it gets mentally hard, which is why you have to have the right people around you to do the business part of it. You have to work really, really hard to keep yourself unencumbered and free. The times I’ve let myself over-worry something or get too scared about something, those have been difficult times. For a while, I used to let myself get too overzealous—that’s the word—about my work. I’d sometimes go to the theater two and a half hours before the performance and actually almost do the whole performance before I did the actual performance. I finally had to have a severe talk to myself, saying, “This can’t be what it’s about.” But that was early in my career, when I was first on Broadway. [Hesitates.] Does that answer your question? AVC: Absolutely. But it also raises another question: When did you make the jump from San Francisco to New York? JT: Oh, I waited forever. I didn’t go to New York until I was 35 years old. I was in repertory theater for almost… let’s see, probably five, six, seven years. I went to New York late, and I’m glad I did. But then I had a good break—I had a great agent at ICM, a woman named Sheila Rich, who really believed in me—and I did Measure For Measure at the park, and then I went to Sly Fox, with the great George C. Scott, directed by the great Arthur Penn, written by the great Larry Gelbart. It doesn’t get better than that. And it was from there that I went into …And Justice For All. They saw me in Sly Fox, and that’s how I got my first film. AVC: That’s not a bad bunch to be working with for your Broadway debut. JT: Oh, it was an auspicious Broadway debut: I had three lines when I started. I said, “You look wonderful, sir,” and I said it three times. [Laughs.] And then I sort of worked my way up through the cast. I played Lawyer Craven. I understudied the great John Heffernan on Wednesday matinees when he had his commitment to… I think he was doing a soap opera? And then I understudied Hector Elizondo. And then when Hector left the show, I took over. I did one night with George, and then I did almost a year with the great Robert Preston. Boy, what an education. And then I came out here [to Los Angeles] to the Schubert Theater, and I played a role Bob Dishy originated, jealous husband Abner Truckle, working up against Trish Van Devere, with George. And that’s when I was discovered for …And Justice For All. Barry Levinson and Valerie Curtin wrote the script, and they saw the show one night, and I got the audition with Norman Jewison from that. …And Justice For All was my first big break outside of theater. I was nervous, excited. And what’s interesting is that of course it starred Al Pacino, but now this year, I just completed the movie about the Phil Spector story, starring Al Pacino. So there’s something to this full-circle thing. I kind of like that. AVC: Had you maintained a friendship with Pacino over the years? JT: Not really, no. But certainly I think that, in the acting pantheon… He’s just so remarkable an actor that he’s sort of been a mental guide all the way through my career. It’s so wonderful to watch him act. He inspired me in the beginning, all the way through the years, and, y’know, here I am. And he’s jaw-dropping in this performance. And Helen Mirren’s in it, it’s written and directed by David Mamet… I’m so lucky. There they are: a god and goddess of the acting pantheon. But Al… I can’t speak enough about that guy as an actor. He just kills me, he’s so good. AVC: Beyond getting to act alongside Pacino again, this also isn’t the first time you’ve had Mamet’s material to work with: You were part of a production of Glengarry Glen Ross several years back as well. JT: Oh, yeah, that was great. But, I mean, of course, it was. It’s David Mamet. AVC: You already played a round of Random Roles the last time you talked to The A.V. Club, but there’s one that was glossed over which is hard to resist asking about, especially since you mentioned it earlier: K. Edgar Singer in Muppets From Space. AVC: Looking back, we also haven’t talked to you since you did the Hangover films. AVC: To bring it back to Bent, you mentioned that your character teaches acting, which you do as well. Did you relish the opportunity to poke fun at that side of yourself? JT: I do. Although I don’t wink when I’m doing it. I play it for keeps. Or I try to, anyway. [Laughs.] I think acting classes… honestly, I have never seen that played well on TV, and I’m not saying I do it well on Bent, either. It’s easy to poke fun at it, but there are a lot of acting classes out there, and I thank God for the ones I had. I had some really great teachers. So it might be funny, but when I do it, I’m still trying to play it as sincerely as possible.